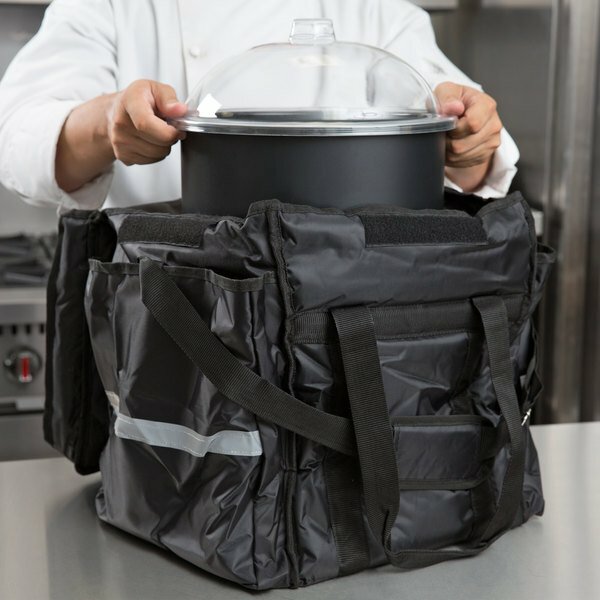 ServIt Insulated Food Delivery Bag, Black Soft-Sided Heavy-Duty Nylon with Black Cold Crock, Lid, and Ice Pack, 13" x 13" x 15 1/2"
ServIt Heavy-Duty Insulated Food Delivery Bag, Black Soft-Sided Nylon with 22 Qt. 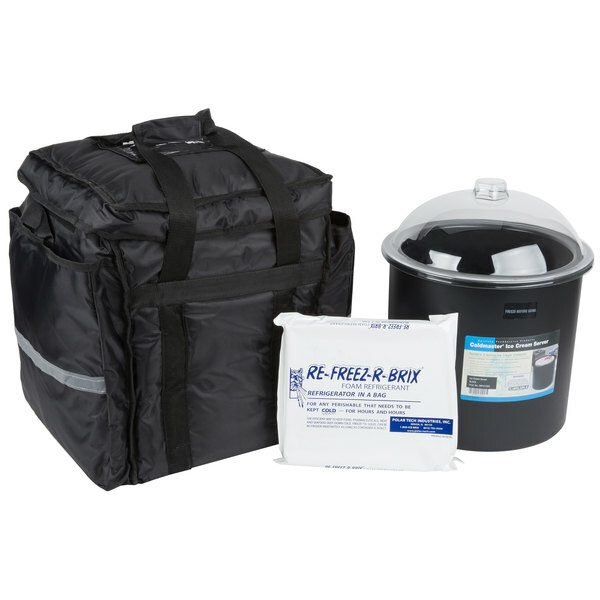 Container, Lid and Thermal Pack, 13" x 13" x 15 1/2"
Get ice cream to offsite catered events with this dependable ServIt 13" x 13" x 15 1/2" heavy-duty insulated food delivery bag with Carlisle Coldmaster 3 gallon black ice cream cold crock, lid, and ice pack! Whether it's for a catered graduation party, wedding reception, or other event, ice cream needs to be frozen for service. This premium food carrier is designed with all the upgrades your delivery persons need to get a 3-gallon tub of ice cream to your events, each and every time. 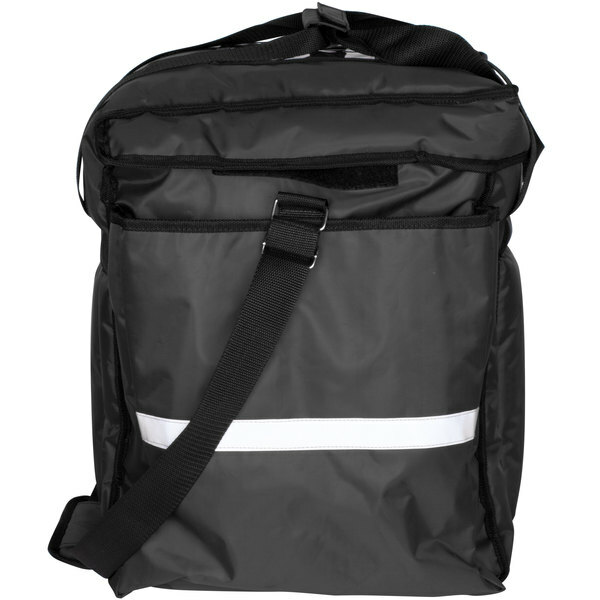 This reliability is made possible by a sturdy design, reinforced straps, insulated sides, and convenient features, like extra pockets and an ID window. Simply freeze the NSF Listed cold crock for 8 hours prior to transport and your ice cream will stay at or below 32 degrees for a 6 to 10 hour time span thanks to its non-toxic refrigerant! 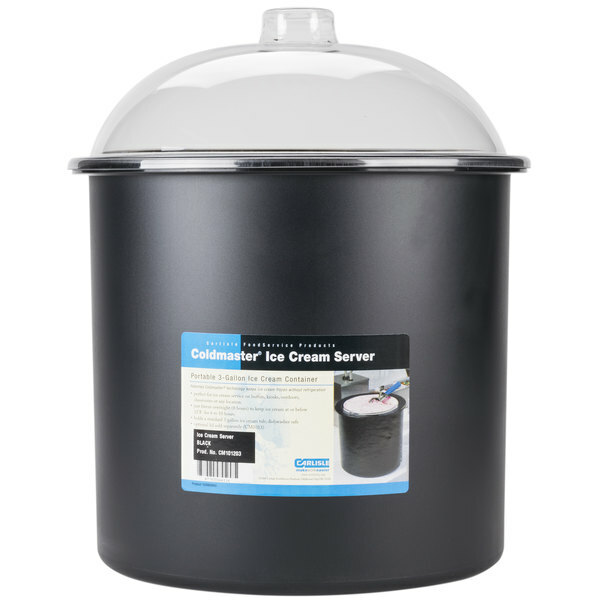 Place the ice cream tub in the crock just prior to transport, cover with the included lid, and place in the delivery bag. 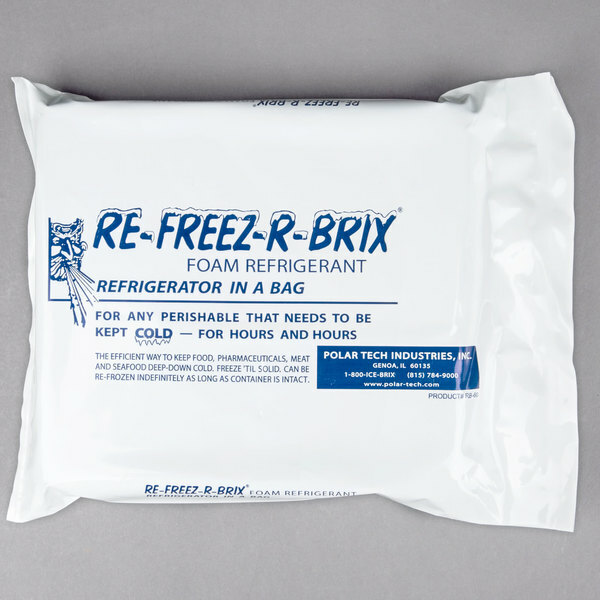 Tuck the included reusable ice pack into the pocket in the lid of the bag for additional temperature protection. This delivery bag's durable nylon exterior is both water resistant and easy to clean, just like the interior of the bag, and it features a sleek black coloring that's sure to offer a professional presentation. Reinforced straps promote safe, comfortable lifting and a hardboard bottom ensures stability when moving from cart to vehicle and back again. A shoulder strap with pad makes for hands-free holding from one location to the next. 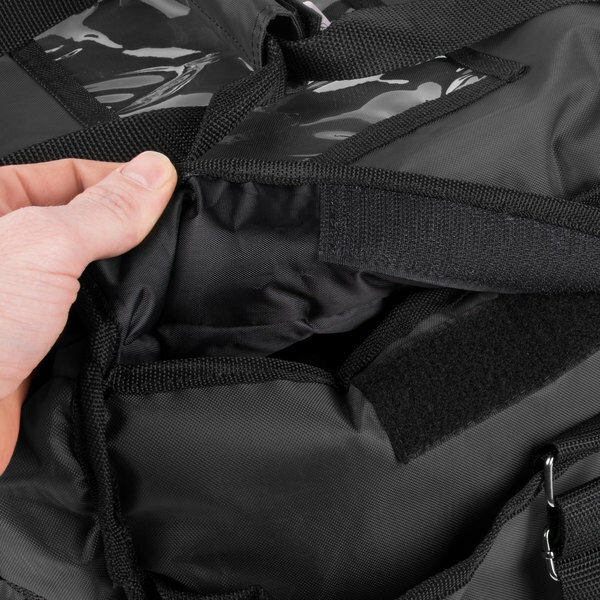 Extra fabric at the flap holds cold air in while Velcro® strips ensure quick opening and closing of the bag. These Velcro® strips remain secure during transportation, preventing the crock from shifting as it travels from the kitchen to the final destination or venue. You need cold food to remain cold during transport. This carrier makes sure that happens with 2" thick poly batting insulation on all sides of the bag. It keeps ice cream, gelato, and other frozen treats frozen at the proper temperature as you travel. 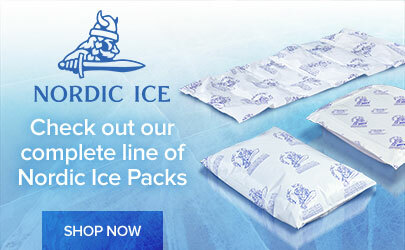 Plus, an ice pack is included! For your convenience, a transparent ID window on the exterior of the bag allows your staff to store menus, coupons, and business cards. Reflective stripes give your staff the safety they deserve when on the road, making this bag the ideal option for day or night delivery. For extra storage of essential catering items, two Velcro®-closure, non-insulated pockets provide this added space. The item that I received has different dimensions than the ones that are listed. Why? Due to the universal nature of this product, some of the dimensions may vary slightly. 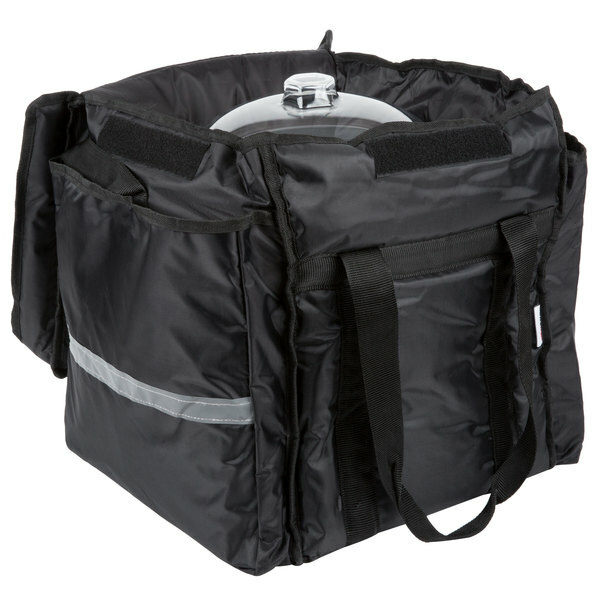 What Fits Inside a 13" x 13" x 15 1/2" ServIt Insulated Food Delivery Bag? 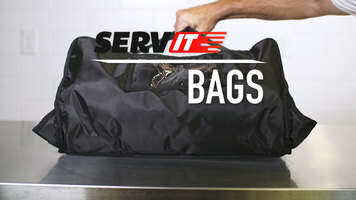 Use this ServIt delivery bag to transport all kinds of delicious take-out! Watch this video to see what you can fit inside one of these insulated delivery bags. ServIt makes delivering take-out orders, pizzas, and catered meals a cinch! 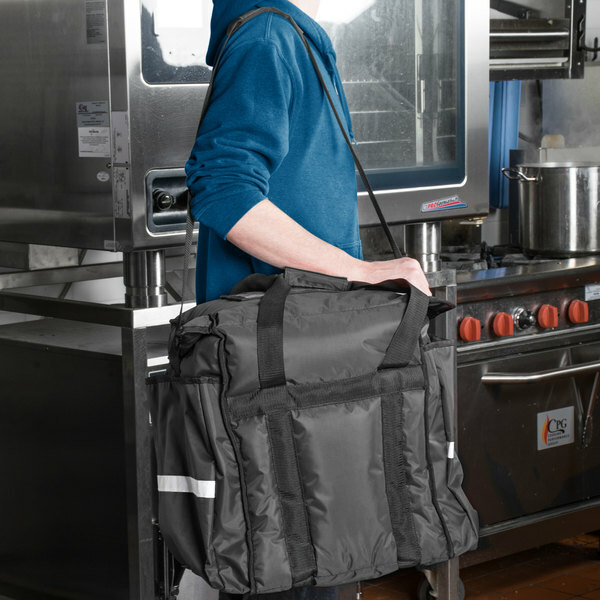 Designed to be easy to load, easy to carry, and easy to clean after use, these bags are ideal for a variety of food service operations. Check out this video for more information. 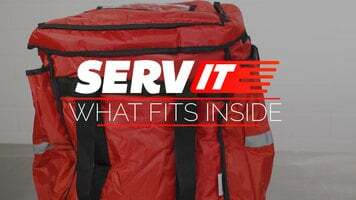 What fits inside a ServIt 13" x 13" x 15 1/2" food delivery bag? Two 9" layer cakes, four large takeout containers, or five 3" half-size steam pans. 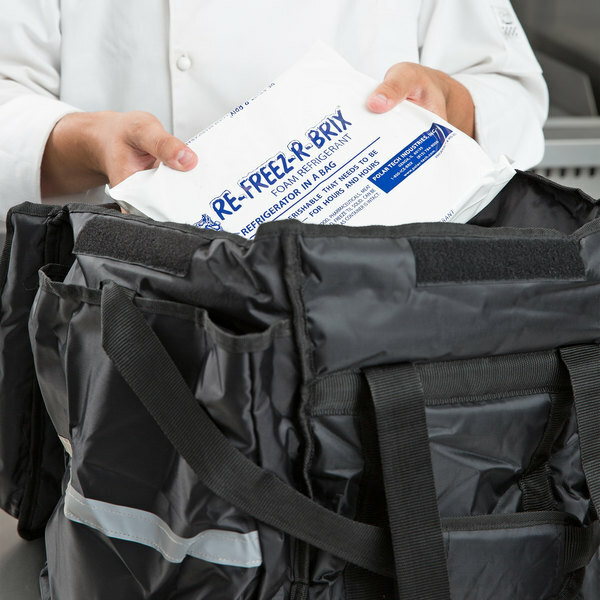 Thick insulation on the ServIt delivery bags makes sure your food arrives at just the right temperature. Made in a variety of sizes, your take-out food and containers are sure to fit in one of these delivery bags. If you are delivering pizza, we have bags that fit 1-3 boxes all the way up to bags for 10-13 pizza boxes. 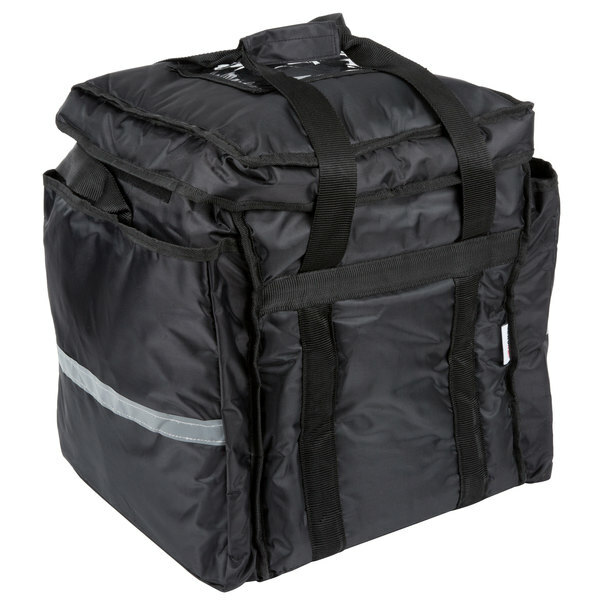 Or, if you’re catering an event we have bags that can fit up to 5 or 6 full sized food pans. For long delivery runs, we offer bags that have extra fabric at the opening flap to help hold in heat. For additional temperature control, choose a bag with an extra pocket inside. 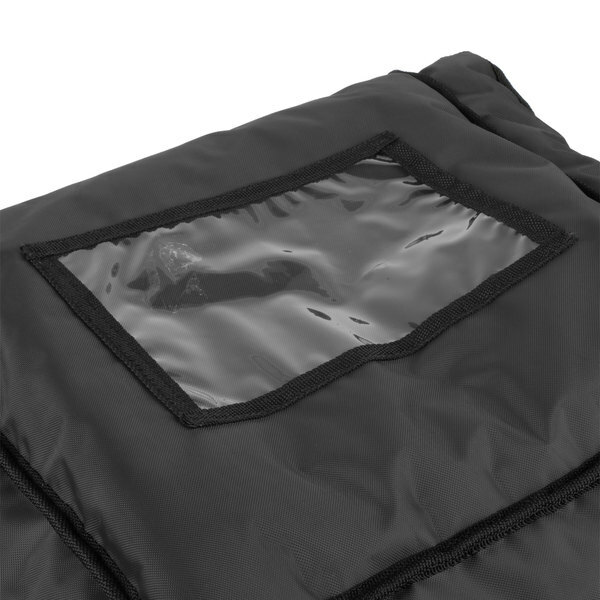 This pocket can hold a heating element or a cooling pack for an extended holding time. 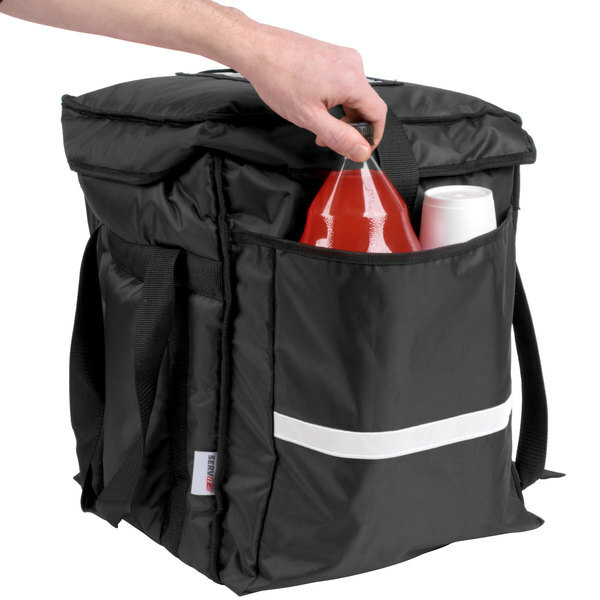 Choose from red or black bags with a reflective stripe to keep your staff safe while on delivery runs, and the reinforced straps help make sure your food remains safe while being delivered. As a bonus, the bags have a designated ID window for quick access while on the go. These delivery bags are conveniently easy to clean, both inside and out. Simply wipe the smooth surface with a damp towel, and you are ready to go! They are even water resistant to keep your food safe from the elements during transport. These delivery bags are made of strong nylon to hold everything you need. Many of them feature insulated pockets to hold two 2 liter bottles of soda. You can even choose a bag with a hardboard bottom for added support for your heavy loads. The hardboard bottom can double as a divider too! No matter what you need to deliver, these bags are up for the task. Some of the delivery bags also feature brass grommets. These allow moisture from steam and condensation to escape, preventing soggy food. So your food will stay both hot and fresh while out for delivery. We have the option of either top or end load style bags. End load is ideal for pizza boxes and other large, flat cargo that easily stacks. Top load bags are better for fitting food pans and take out containers. 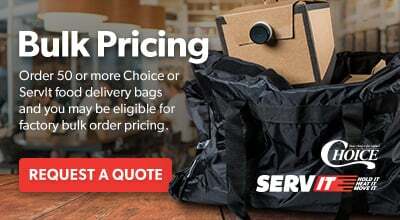 No matter what kind of food you need to deliver, our ServIt delivery bags are the reliable choice.